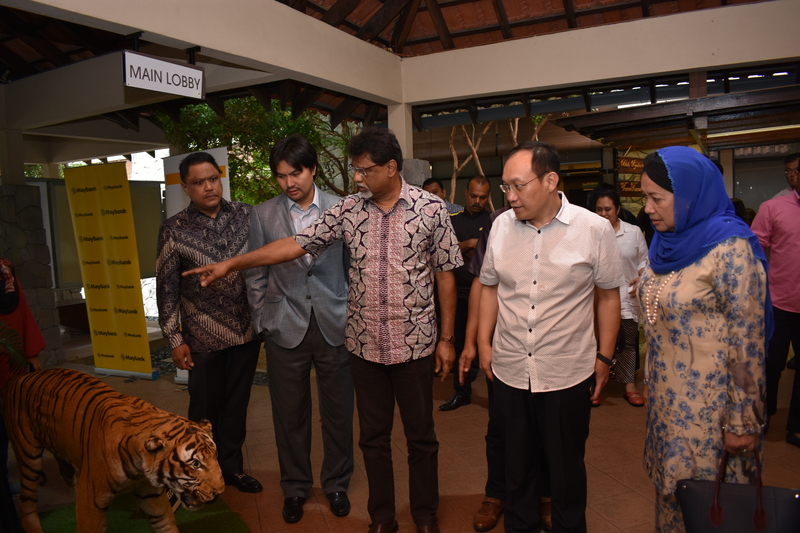 Dr Xavier Jayakumar (third from left), Minister of water, Land and Natural Resources, visited the tiger exhibition prior to the documentary screening. Kuala Lumpur: The message for Global Tiger Day this year rang loud and clear at WWF-Malaysia and Maybank’s new tiger documentary screening earlier today – we are losing our Malayan tigers, and we need to make them a national priority. Aptly titled “On The Brink Of Extinction”, the documentary comprised mini stories told through the eyes of six individuals, all highlighting the need for greater collaborative efforts to save the king of Malaysia’s forests. 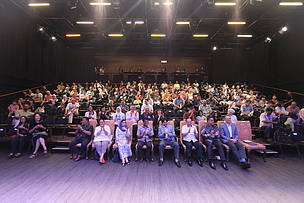 The private screening was attended by a diverse group of close of people, including top officials from the NGO, government and corporate sectors. The event was also graced by the presence of the guest of honour, YB Dr Xavier Jayakumar, the recently appointed Minister of Water, Land and Natural Resources. In his keynote speech at the launch of the documentary series, the Minister highlighted the collaborative spirit amongst government departments in Nepal and Bhutan, two tiger range countries that have successfully achieved zero-poaching. "It is my hope that we will soon be able to engage further with the Royal Malaysian Police, the Malaysian Army and other governmental bodies on halting the poaching crisis. Let us pool our resources and work strategically as united Malaysians to protect our Malayan tigers. If Nepal and Bhutan can do it, why can’t Malaysia?" Speaking at a press conference after the screening, WWF-Malaysia’s Tiger Landscape Lead Dr Mark Rayan Darmaraj reiterated the organisation’s call to step up enforcement efforts in tiger habitats. “We need more boots on the ground if we want to halt the poaching crisis. Project Stampede, which is WWF-Malaysia’s initiative to flood the forests of Royal Belum State Park with more patrol units, is being established for this very reason. Our recent findings indicate at least a 50 per cent decline of tigers within the Belum-Temengor Forest Complex over the past eight years. We are now in a crisis! We cannot afford to wait any longer,” he stressed. Officially announced today after the documentary screening, Project Stampede was conceptualised to aid in reducing the rampant poaching in Belum-Temengor Forest Complex. Although WWF-Malaysia currently has a few patrol teams, a drastic increase in effort is needed to stem the ever-increasing threat of snaring by foreign poachers. Project Stampede’s patrol teams will primarily consist of people from the local indigenous communities, who will be trained to carry out patrolling, remove snares and collect data on poaching. Although they will not have enforcement powers, they will act as the eyes and ears for the enforcement authorities and will report poaching incidents to aid enforcement operation. The continuous presence of these teams is hoped to deter the poachers, besides providing the indigenous communities with an alternative livelihood over the project period. The project aims to roll out ten patrol teams by the end of 2018, comprising at least 50 members. Hence, additional funding especially over the long-term will be needed to sustain this initiative. At 117,500 hectare (ha), Royal Belum is almost twice the size of Singapore. With a minimum standard of 3-5 enforcement personnel per 10,000 ha applied in other parks for protection, Royal Belum would need at least 35-60 patrol rangers. However, the park currently only has 12 rangers who are not armed. “The fact that our teams are continuously finding an increasing number of active snares and poacher camps on their patrols indicates that our efforts have not been sufficient to decrease the threat to tigers and their prey. The upward trend is concerning, as we may soon be facing an ‘empty forest syndrome’ in which the habitat is void of terrestrial mammals. It is important to note that Project Stampede is not a cure for the poaching crisis. At most, we are fire-fighting and buying time, as without specialised and armed tactical teams with enforcement power in place, to respond rapidly in tracking down and apprehending foreign poachers, we will lose this fight. Only if we enable more enforcement boots on the ground and step up intelligence on wildlife poaching and trade syndicates that lead to arrests and prosecution will we be able to save our national icon,” the tiger expert added. The presence of foreign poachers in particular is alarming. Earlier this month, six Vietnamese poachers were arrested in a raid by the Department of Wildlife and National Parks (PERHILITAN), all of whom are believed to be a part of an illegal network that targets mainly tigers. NGOs, enforcement authorities, corporate stakeholders and local communities alike are racing to keep Malayan tigers alive. Unfortunately, poaching for the illegal wildlife trade still remains the most urgent and critical threat to the Malayan tiger. Encik Shahril Azuar Jimin, CEO of Maybank Foundation said that the role of corporates in conservation is a crucial component in fighting poaching and the illegal wildlife trade in Malaysia. “The illegal wildlife trade is an organised crime, and it is threatening the existence of many species, including the Malayan tiger. The support of corporate Malaysia towards tiger conservation efforts can play a major role in improving protection efforts, especially now. The tiger is not just another animal; it is a symbol of national strength and courage. In fact, Maybank’s Core Values are also inspired by the Malayan tiger and is used extensively across all initiatives, including this year’s MyTIGER Values 2018 art competition and exhibition, aimed at encouraging and creating greater awareness of the critical need to save our tigers. If we lose our tigers, it would also mean losing that sense of national pride,” he said. The illegal wildlife trade operates the same way illegal drugs and weapons are dealt with – by dangerous international networks – linking across the globe. The scale of the global illegal wildlife trade as a business is massive, with the United Nations Environment Programme (UNEP) valuing it between USD7 to 23 billion a year in 2017. In a report released in March 2017, the UN Environment and INTERPOL have also estimated the value of environmental crime up to USD258 billion annually. With a growth rate of five to seven per cent each year, environmental crime is outpacing the growth of our global economy by two to three times. After narcotics, human trafficking and weapons, wildlife crime is the fourth most lucrative illegal business in the world. It is therefore important that protecting Malayan tigers becomes a national priority. Globally, tiger numbers have increased in a few countries particularly in India compared to estimates from 2010. Malaysia on the other hand, has only seen a decline in tiger numbers in the past decade. The fate of the Malayan tiger is worse than expected. Through the messages conveyed in this documentary, WWF-Malaysia and Maybank are certain that there is still hope to protect our Malayan tiger for generations to come. We can still ensure their survival if we act now, instead of simply documenting their extinction. It is time for the Malayan tiger to be made a national priority, and a collective responsibility of all Malaysians. This Global Tiger Day, make a stand, spread the message and be a voice for our tigers. The excited audience at the Global Tiger Day documentary screening. 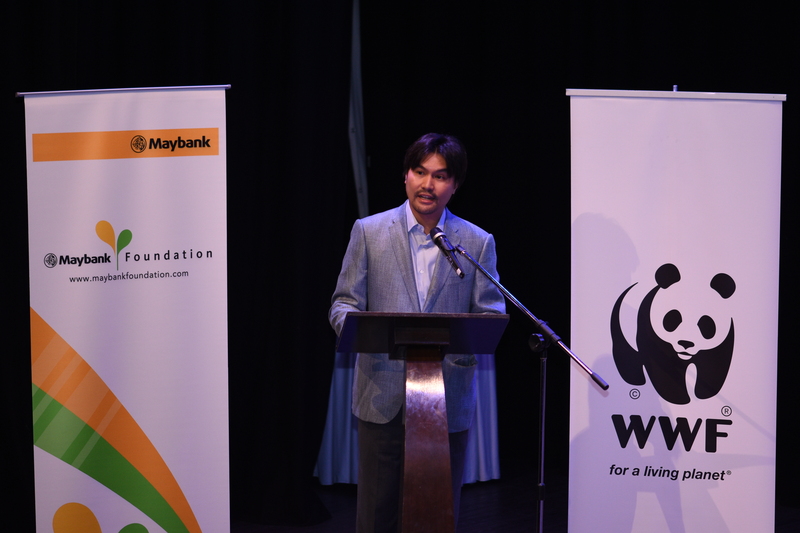 The Chairman of WWF-Malaysia, YAM Tunku Ali Redhauddin ibni Tuanku Muhriz, delivered the welcoming speech. 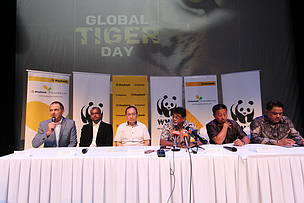 The press conference held after the screening consisted of (L-R): Mr Robert Basiuk, WWF-Malaysia trustee; Dr Mark Rayan Darmaraj, WWF-Malaysia’s Tiger Landscape Lead; YBhg Dato’ Dr Tan Yew Choong, the Secretary General of the Ministry of Water, Land and Natural Resources (KATS); YB Dr Xavier Jayakumar, Minister of Water, Land and Natural Resources (KATS); YBhg Dato’ Abdul Kadir bin Abu Hashim, the Director General of Department of Wildlife and National Parks; and Mr Shahril Azuar Jimin, CEO of Maybank Foundation.